To make the Minor I organs most versatile, the Swell division is very large, maybe even larger than the Swell on a competent three-manual instrument. This allows for the most dynamic flexibility, and also allows a wider range of literature to be played, for instance repertoire that requires French reed choruses, strings, Vox Humana, and the like. Still, it is a two manual organ and some compromises have to be made when dealing with smaller instruments. Compared to the Swell, the Great is less versatile, but it does include a Flute Celeste to use as accompaniment to Swell solo stops, and a moderately voiced 8′ flute to accompany swell stops when an undulating stop isn’t wanted. A more robust positif-type Clarinet on the Great serves as the only great reed, primarily for more German character and contrast to swell solo stops. However, it is under expression in the Swell box and is also affected by the Swell tremulant. The Principal Chorus is typical of an American Classic Organ of this size. 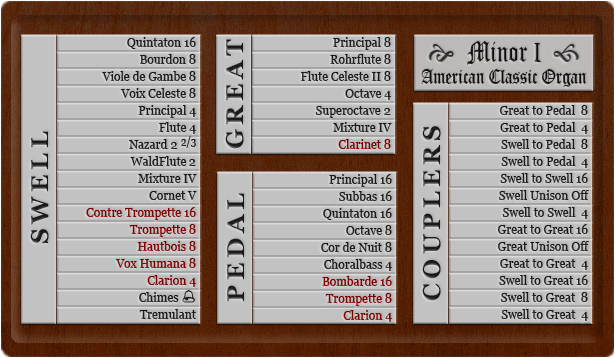 For an organ of this size, the pedal division is well rounded, and has both Principal and Reed choruses and some softer ranks as well. The Great Flute Celeste II 8′ is under Swell Expression and the Great Clarinet 8′ is under Swell Expression and is also affected by the Swell Tremulant.